My fellow hip hop enthusiast KEVIN BEACHAM has really hit the bullseye dead centre with his latest post over on FIFTH ELEMENT ONLINE. I gotta say his blog and radio shows are some of the finest material available online if you have the urge to brush up on your hip hop knowledge and learn about the real deal rappers from the golden era. This week KEVIN has given some well deserved shine to a Brooklyn MC who rarely gets discussed in hip hop circles, even though many serious hip hop fans know the deal with his records and consider them classics. 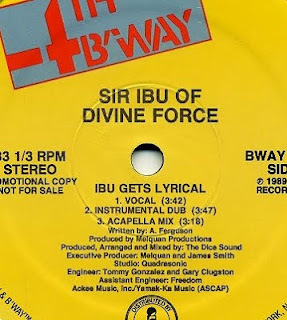 The MC in question here is SIR IBU from DIVINE FORCE who most notably dropped "Holy War (Live)" on YAMAK-KA RECORDS back in 1987. Slightly harder to find was SIR IBU's solo release a couple of years later "IBU Gets Lyrical" b/w "The Peacemaker", but both records are incredible production and both as raw as sushi. Check out KEVIN's superb review HERE.